This morning I was finally able to sleep in late. It's hard to believe that earlier in the week I was in Alaska. Since I came back during the work week, my breakfasts have consisted of my usual weekday cup of Fage yogurt, so this morning I was excited to make a "weekend breakfast" in my own kitchen (although it was so late when we ate it was really brunch). I've kept this week's meals pretty simple because my jet lagged brain couldn't be trusted doing anything that required much more than that. 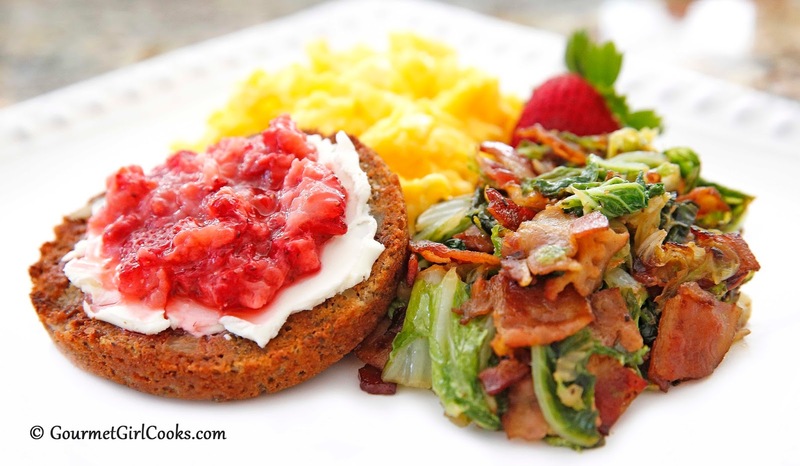 I thought about making my "no-flip berry pancakes" or an omelet, but after a quick scan of my fridge (that I went shopping to restock last night), the large head of Napa cabbage was what caught my eye...then the bacon, eggs and Saran wrapped leftover piece of Vidalia onion on the shelf. It was crystal clear to me that the only thing that made perfect sense this morning was making scrambled eggs with sharp cheddar cheese and Napa Cabbage Bacon & Onion Hash to go beside my eggs. I remembered that the day before I left for Alaska, I made a batch of my Grain-Free Power Bagels and packed one to take on my trip and then froze the remainder. I grabbed one of them from the freezer, did a quick thaw for a few seconds in the microwave and then toasted half of one and spread it with cream cheese and topped it with fresh mashed ripe strawberry (who needs jam when you have super ripe fresh berries). It was a delicious "first weekend back" breakfast. Even hubby enjoyed it. I was skeptical as to whether he'd eat the hash but he did and really enjoyed it (of course I didn't mention that I put onions in it...hee hee hee...but I caramelized them so well he couldn't detect them and all you could really smell cooking in my kitchen was BACON). I snapped a couple photos below and included the ridiculously easy recipe below. Enjoy! 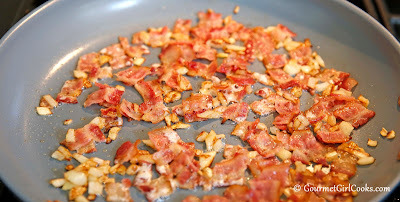 The smell of bacon and onions cooking screams "weekend" to me! 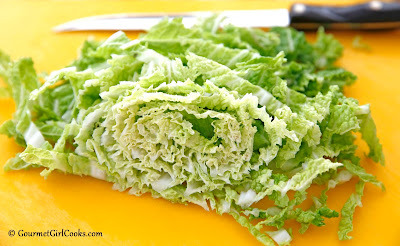 For those that aren't familiar with Napa cabbage, this is what it looks like. 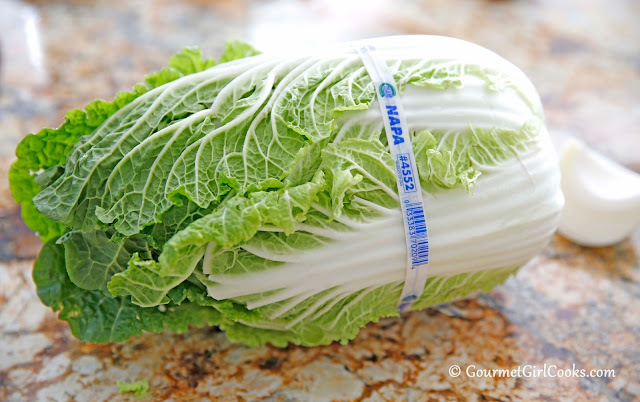 It's thinner and more tender than regular green cabbage and great in soups. 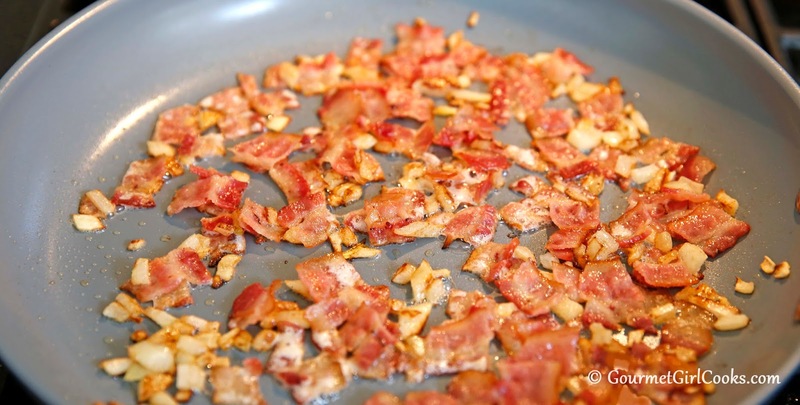 In a large 12-inch skillet, cook bacon and onions over medium-high heat until bacon is cooked and onions are translucent and begin to caramelize, about 5 to 10 minutes. Add cabbage and cover skillet to wilt cabbage for about 5 minutes. Uncover and stir frequently until cabbage is tender-crisp or desired consistency. Season with salt and pepper, to taste. I have never heard of Napa cabbage.